It's no secret; exercise takes a lot of work and effort. But sometimes, no matter how much work you put in, results are hard to come by. When progress peaks, doing more might not be the answer. To get stronger, don't work more, mix up your fitness routine instead. One tried and true method to switch up your regimen is kettlebell training. For example, upper-body workouts are typically the same, tedious routines such as chest press, overhead press and bent rows. Sure, you can alternate between barbells and dumbbells. From week to week you switch out the flat bench for the inclined version. You might even opt to include supersets or negatives in your training session in an attempt to get more out of your routine. Sooner or later results will cease to exist. Then what? Making your workout count means you need to continually challenge your muscles to do more. 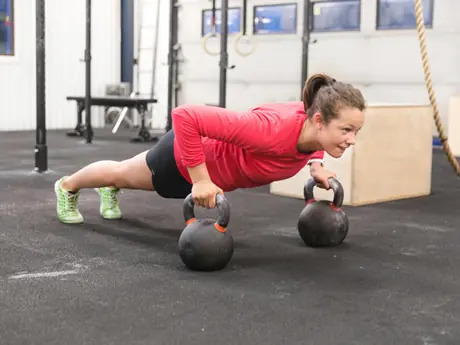 Upping the intensity, adding additional resistance to a movement, or using new exercises to increase muscle engagement will make a world of difference. This is why kettlebell training is ideal. More specifically, with respect to upper-body workouts, using a kettlebell allows you to challenge your muscles like never before. Kettebell exercises allow you to strength train while working your cardio because they increase your muscle activation and heart rate at the same time. What's more, kettlebell-based exercises are more functional than traditional weight-training machines. Machines isolate one muscle while kettlebells target multiple muscles at the same time. Try these moves to boost your heart rate and increase muscle strength in an efficient manner. Begin in a high-plank position. Place your hands, fingers spread wide, on the ground just outside of your armpits. Extend your legs straight back and press your toes into the floor. Engage your core and activate your whole body. Shift all of your weight onto your left hand so you're able to lift your right hand and grab your kettlebell. With your kettlebell in-line with your shoulder, row your elbow to the sky, pulling the weight to your shoulder. Lower the weight to the ground and repeat. Make sure your hips don't rotate open. To avoid this, spread your legs a little more than hip-width apart for more stability.